backgrounds; an Indo-Tanzanian father and Euro-Canadian mother. Her fourth, self-produced album “Rooted” combines spiritual & philosophical musings with upbeat folk/jazz/world sounds. In addition to music Alysha also conducts arts education workshops in schools, promoting diversity in music and mentoring in self-expression through the arts. 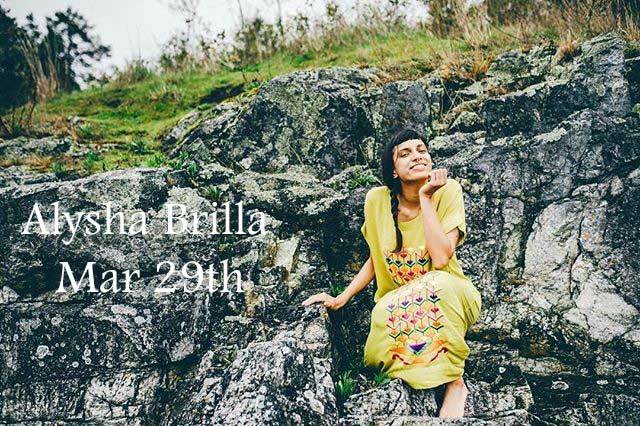 2018 Juno nominee Alysha Brilla is an artist, music producer and songwriter. Her music, blogsand spirituality are inspired by growing up with parents from two different cultural and religiousbackgrounds; an Indo-Tanzanian father and Euro-Canadian mother. Her fourth, self-produced album “Rooted” combines spiritual & philosophical musings with upbeat folk/jazz/world sounds. In addition to music Alysha also conducts arts education workshops in schools, promoting diversity in music and mentoring in self-expression through the arts.